I currently have 3 projects going. The big one is the baby sweater for my friend, due in August. I had to stop and wait for more yarn . . . and it's just come in so after posting I'm off to the LYS to get it! Yay! 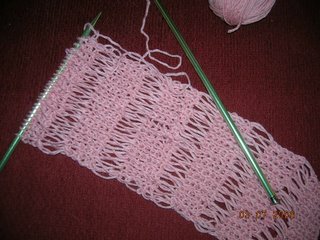 I will cast on the stitches from the stitch holder on the right shoulder and do the rest of that sleeve and the front quickly. I did put in the spot for the pocket on the right . . . hard to see in this pic . . . but I think I'll skip the left one. This second project is just a whimsy. 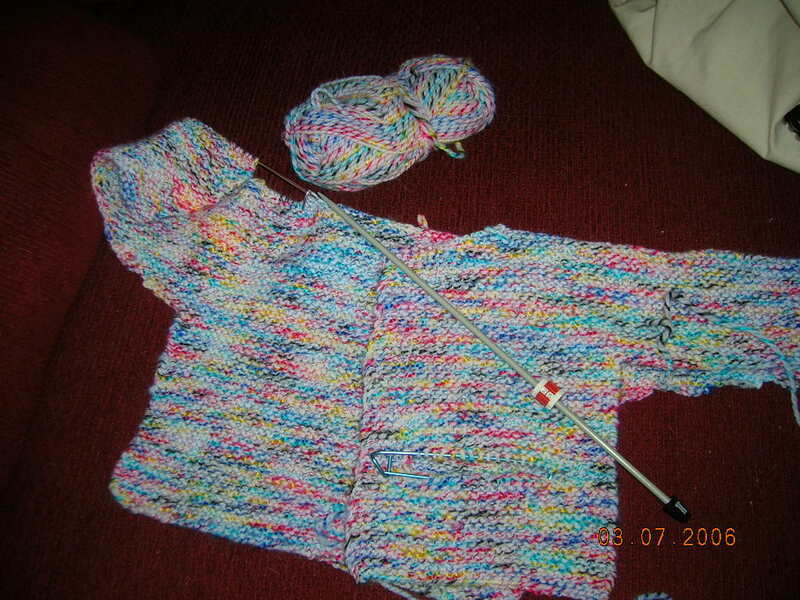 I had yarn from my M-I-L's stash and just got these huge (13) needles, and had to try something fun. Every 6th row you wrap the yarn around 2 times after each stitch, and the next row you drop those wraps. Lovely effect. I'll make it as long as it takes to use up the yarn I have. 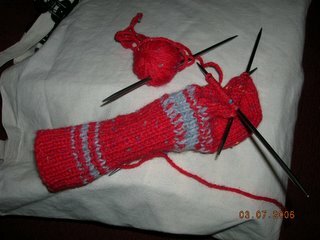 The third project is the one that frustrates me. I started this pair of socks for my son so he wouldn't have to wear the ones with purple . . . but a.) he likes those other socks now . . . and b.) he is in a growth spurt and when he tried on this sock last night he declared it too tight. Hmph. Anyone know a kid for this sock? Problem: I've lost the motivation to finish. LOL. You know what I would do? I'd frog the sock and knit something else!